Deep within the purply hues of the indigo forest, a precious pixie awakens from her dream-filled daytime slumber... a small child needs her help On a magical rhyming journey through a starlit night, the Paci Pixie and her woodland friends give a small child the encouragement and strength she needs to hand her paci down to a new baby and achieve one of many childhood milestones with excitement and magical delight! Includes read along CD! The story was inspired when Cheryl's son Dylan had a difficult time weaning off of the pacifier. She wrote a nursery rhyme about The Paci Pixie to help her son. Her cousin and co-author Amy Perreault suggested they write a book to accompany the nursery rhyme. Her husband, Steven Perreault, a graphic designer created The images in the book. Also another family member, Lynne Hajjar, Amy's sister can be heard singing the nursery rhyme and speaking the audiobook. The work is truly a family affair. Amazing book and CD… reads the book and plays a beautiful song. Haven’t heard about the paci in weeks. Your kid is hooked on the paci.. You have to get this book! The Paci Pixie is so beautifully done! The story, the illustrations, the incredible attention to the tiniest details gave me goose bumps and a sense of awe with every page we turned. My daughter quickly overcame her fear of losing the paci because the authors transform that fear into a magical journey. This book is perfect for baby showers and new parents everywhere! 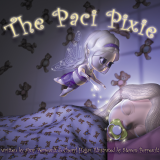 The Paci Pixie is a wonderful book for any child facing the fear of not using their pacifier anymore. My children love the book, illustrations and nursery rhyme. My daughter is seven and never used a pacifier, but she still loves the story. My three year old was very fearful of losing his pacifier, but after reading the book he said he now wants to see The Paci Pixie take his very soon. The story is soothing and beautiful with wonderful illustrations! My sister read The Paci Pixie to her three-year-old son who used a pacifier to help him fall asleep. She explained it was time for the Pixie to take his pacifier away to sprinkle it with pixie dust and prepare it for another little boy or girl. My nephew was so excited to help a younger child fall asleep before reaching “big boy” age, and he hasn’t used a pacifier since. This magical little Pixie knows just what to say to help your child feel good about growing up and giving up his pacifier. It is a wonderful resource for parents and pediatricians.